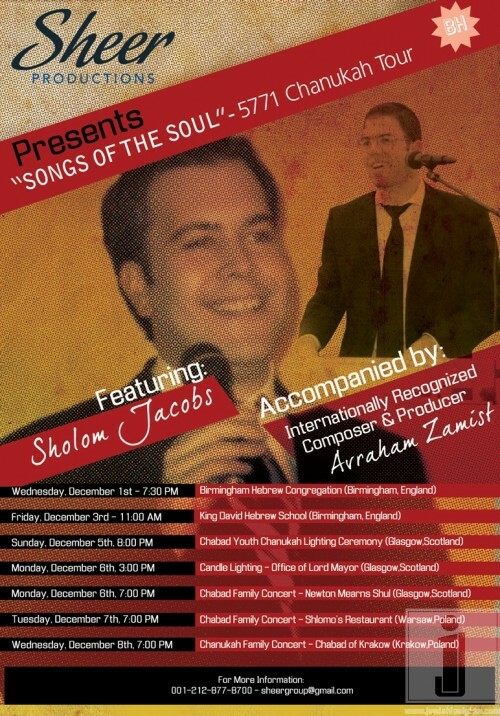 New York, NY (FPRC) December 1, 2010 – Sheer Productions today announced the 5770 “Songs of the Soul” Chanukah Tour, featuring artist Sholom Jacobs. The tour features five shows throughout the United Kingdom, Scotland, and Poland, and includes a Chanukah and Religious repertoire. Sholom Jacobs has performed throughout the United States, Europe, and Israel and has also served in various Chief Chazzan positions for Synagogues throughout the world. Sholom will be joined by composer and producer, Avraham Zamist, who has an extensive background in event and studio production.